Jaisalmer, famously known as The Golden City of India is located in the Indian state of Rajasthan. It is a famous heritage site that can be called as one of the jewels of our country. The city hosts many visitors and the most common attraction of touring here are the desert camps. The city also holds an annual desert festival. It is a very colorful event and is certainly the best time to visit there. This article will guide you about the top places where you can enjoy the amazing Jaisalmer Desert camp experience. Use coupons to make this experience more enjoyable when you get exciting discounts. If sleeping under the starry sky and enjoy a luxurious camping stay was what you always wanted to consider one of the places mentioned in this post. The best time to visit Jaisalmer and fulfill this wish of yours will be between October and March to get the best experience in desert camping. While there are small restaurants of Chokhi Dhani in major Indian cities that give the Rajasthani feel but visiting Chokho Dhani in its hometown is a different experience altogether. Also here you can enjoy a stay facility where you stay in desert camps which are fully equipped and fun to stay in. Chokhi Dhani is rated as one of the best camps by tourists to stay in. If you want to experience an authentic Rajput lifestyle go and check in here. In this resort, you can choose between two types of camps, the regular camps, and the luxury camps. Both the camps are surreal and beautiful just their facilities and cost may vary. Try out traditional Rajasthani dishes and some daal bati choorma during your stay. Apart from that, there is Indian, Chinese and continental food that is served. Find the resort listed don MakeMyTrip website and use your MakeMyTrip coupons to save on your bookings there. The mama’s resort and camp in Jaisalmer come with a promise of giving you a charming experience to all the guests that visit here. The resort which is located inside the Desert National Park in Jaisalmer was built with an intention of preserving the ecosystem of the Thar Desert. The camp has luxury tents and desert safaris to offer to the tourist who comes here. Along with tents and safaris, there are a lot of cultural activities that take place which introduce the tourists to the local culture. There are cultural shows, dances, and music. There are a lot of options when it comes to dining here, in the midst of the exotic sand dunes of Jaisalmer. There are a veranda and sitting area attached to each of the tents which finds its light source from the lanterns and torches of live fire lit and which compliment the light that comes from the moon. Get yourself a cottage room, super deluxe cottage room, or a Swiss luxury tent at the mama’s resort and camp by using MakeMyTrip coupons. This resort is as mesmerizing as others in the list but this resort has a unique attraction for the visitors here. 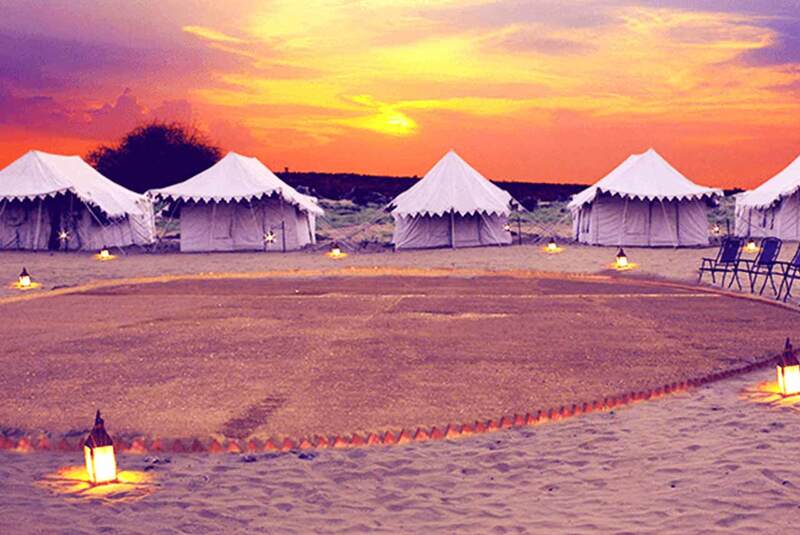 The Joggan Jaisalmer Camp offers customized camping options that will ensure you utmost comfort during your stay here. All the customizations can be arranged at the campsite. With this, you can surprise your spouse or your children. Here you are also offered some adventurous activities like camel safari, dune bashing, quad biking and others which you will know about at the reception. You can book luxury tents that have a bonfire, personal verandas and soak pool facilities. The resort has a huge capacity for accommodation which makes it the best option for larger group accommodation. The Safari Nights Resort is the best option to go if you want to experience the true essence of desert life. this is another one which has the customization living option. Tourists visit here because of the great services that they offer. The customization is truly unique in its approach. Whatever may be your liking, whether you like to enjoy the rich heritage or the beauty of nature, you will get everything here as per your taste. Here you can choose from a cottage room, Swiss tents. Use your MakeMyTrip coupons when you book your room at the Safari Nights Resort. Want to go to Jaisalmer but live swiss life? Visit the Damodra Desert Camp. Here you can enjoy living in highly equipped swiss style cottages and also relish the experience of Jaisalmer desert camping. For all those looking to live the authentic life without their usual modernity’s and luxurious comforts, this is the place that would best suit you. During the day time, you can experience the rich culture of Rajasthan with the traditional folk songs and dance. Get the taste of Rajasthan by indulging in their traditional delicacies and camel rides offered here. For all the card game lovers, the resort hosts a hookah lounge where one can play board games and card games and have a jolly experience here. The book your stay at the Damodra Desert Camp by using coupons. The resort has been liked overall by the visitors and all of them vouch for it. Now that you know about the best resorts where you can spend your time during your stay at Jaisalmer all you have to do is to choose where you want to stay. Once you have made your mind, you can use your coupons to book your rooms here. Do not forget to check out the facilities that are offered in each of the resort. Apart from this here are the different interesting places where you can visit when you are in Jaisalmer. A number of Jain temples like the Parasawanath temple, Chandra Prabhu temple, Shanti Nath temple, Rishabdev temple, Shitalnath temple, and Kunthunath temple. Pilgrimage centers like Amar Sagar, Brahmsar, Lodhruva, and Pokhran. ← 5 Steps On How Bloggers Can Nail The SEO Optimization Process!